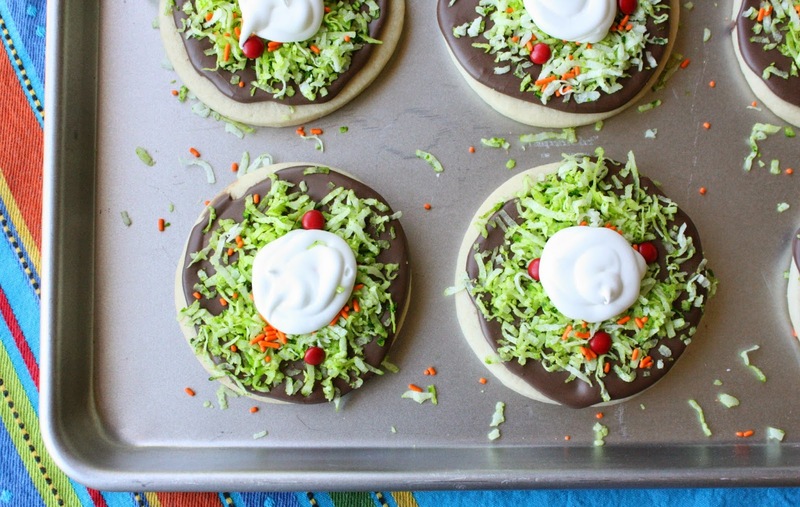 Cinco de Mayo is in five days and as I thought about a cookie to make, I remembered the cute, little taco cookies from last year. Though I never blogged about them, I did post them on facebook. The tiny tacos were 100% inspired by the amazing Sandra, of Project Denneler! Of course, with tacos on the brain, tostadas followed right behind. I knew I had some extra chocolate royal icing in the fridge, which sealed the deal for tostada cookies. I also knew I had another fun, easy cookie to add to my repertoire...woo hoo! *For the grated cheese, another good option would be orange candy melts, grated. 1. Roll out cookie dough 3/8-inch, cut out rounds, and bake according to recipe. Let cool. 2. With an offset spatula, spread some chocolate royal icing on the cookie. 3. In a ziploc sandwich bag, tint the coconut with a small amount of green food coloring, and shake until coconut color looks like lettuce. Apply on top of chocolate royal icing while it is still wet. 4. Sprinkle orange jimmies on top of the coconut. 5. Add a few mini, red m&m's as tomatoes. 6. Using a pastry bag and large round tip, apply the white royal icing "sour cream". 7. Let cookies dry overnight. It will all adhere together. The chocolate/coconut combo was muy bueno! This is such a fun idea...love it! I love the 'lettuce' super cute!! Such a fun idea! I don't even know what to say, other than that these are awesome! These are just tooooo cute! What a clever idea. I swear you make the cutest cookies ever! I totally love these. Oh my goodness Sue, these are amazing. Even the giant man-baby looked over and asked what they were (thinking anything other than cookies!) And the little tacos are awesome too. Yes! Yes! Yes! These are so very kitchen-clever. Love 'em, Sue! These look fun! Those coconut lettuce leaves look so real. I LOVE these Sue!! 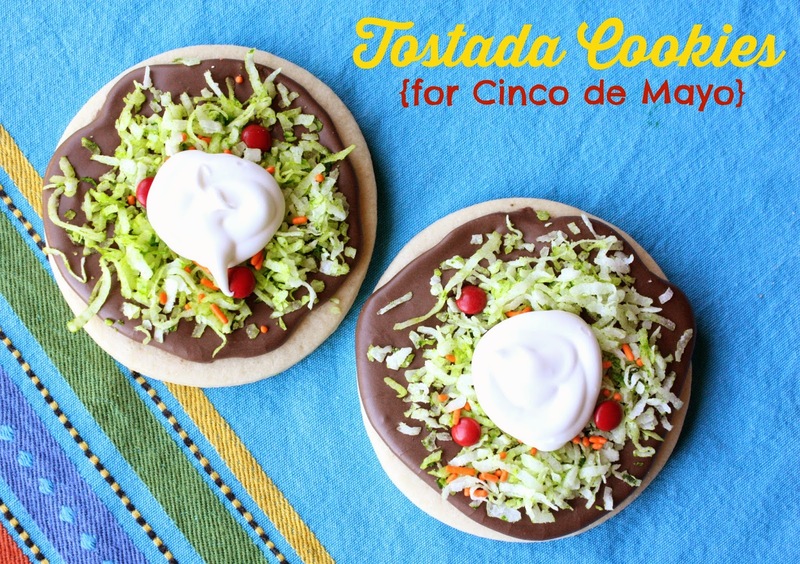 They look like a real tostada and they are my fav! Pinning now! I love these Sue! They look exactly like Tostadas! Thank you so much for linking up at Party in Your PJs. Congratulations on your feature on "Party in your PJ's at Simply Sweets by Honeybee!